I would say that the main challenges for me were unique to the subjects that I chose. For one ‘s very hard to capture movement with ravens as they don’t stand still for long. Unlike a dog or cat the only time you can catch a bird sleeping is at night in a tree basically, so I had to capture movement with sketches as well as photos. Texture was also a challenge, birds feathers are very complex and have a different texture in different parts of the body. As always I enjoyed using the ball point pen the most, for the sketches of the ravens in Grabbing the Chance. 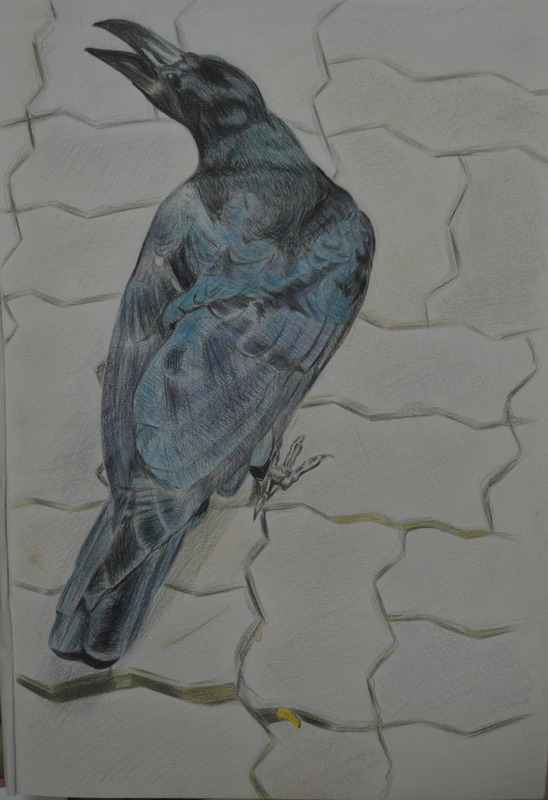 With the ball point pen and the colour of the raven’s I could almost do a continuous drawing of the birds. Coloured pencils were great for the finished drawing in grabbing the chance, they captured the details well and were great for layering all the different colours but they weren’t dark enough to capture the deep colours of the bird. hard pastels may have been better for the job. Where can you go to draw more animals? The only real place in Bangkok to draw animals unless you have a pet or live in a street where the stray dogs run freely is the zoo. I went to the zoo with the intention to draw different animals but came across the ravens while there.